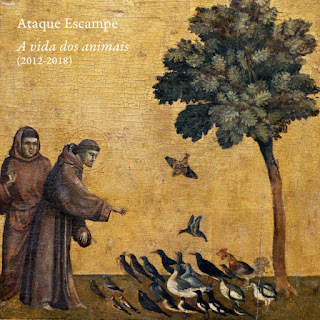 Comment: Ataque Escampe did have released their first releases on the imprint A Regueifa Plataforma which had been an outlet for musicians singing in Galician, a local language in Spain having at least as much similarity to Portuguese as to Spanish/Castilian. As much as I have understood A vida dos Animais is their last issue embracing so far unpublished, demo and compilations-related tracks from the years 2012-2018. Musically it is as transgressive as they are linguistically (they sing in English as well). Lots of experiments within the genre of indie/alt-folk with melodies, timbres and harmonies. Fortunately all these experiments are finely balanced with the acceptance of beauty oozing out from these chords. By their attitude they remind of Wilco by incorporating many elements into the embodiment of folk music. For example, at excellent Evita one can immerse in an enchanting noise pop/folk crossover. Lots of electricity, sweat and desire could you find out from there. Maycar is a nice cover of a classic Motown track. Musica Veliz is as cinematic as it is thoroughly dreamy. It is a fine example of how to create and convey a mood. Undoubtedly a combo which deserves more attention.